Vegan peanut butter chocolate brownies you will gobble up before you know it! These enticing brownies are rich in cocoa and topped with peanut butter and crispy pecan nuts. Sprinkle them with a dash of pink Himalayan salt to enrich the velvety flavour. Growing up, chocolate brownies were one of the weekly classics in my household. My mum is a huge baking enthusiast and an incredible cook, but not vegan, so trying to veganize her aaamaazing brownies was quite a task. I’ve been trying to bake the perfect vegan brownie for longer than I’m willing to admit. 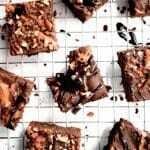 How do I make sure my brownie isn’t too crumbly and dry? How to make it chewy in the middle? And how to find the perfect cocoa:sugar ratio? You might have been wondering the same before which is why I’m so delighted to finally bring you a chocolate brownie recipe I am wholeheartedly proud of. P.S. – They are also the perfect dessert to make when hosting your non-vegan friends. These easy and fail-proof dessert recipes are becoming quite a trend here on My Vegan Minimalist. The secret winner of our vegan chocolate brownie is the flaxseed egg – a vegan baking classic. This will prevent your brownie from becoming too dry and crumbly, while not interfering with the taste. My vegan peanut butter chocolate brownies are super easy to customise. Not a fan of peanut butter? Leave it out or substitute it for almond butter! Not a fan of pecans? Why not try using hazelnuts, brazil nuts or peanuts. Once made, keep refrigerated in an airtight container for up to 5 days. Melt chocolate over a simmering pan of water or in the microwave until completely melted. Combine 2 tbsp of ground flaxseed and 6 tbsp of water to make your two flaxseed eggs and put aside to set. Mix together oil, vanilla, and almond milk. Add the oil mixture and flaxseed egg first and then add melted chocolate. Roughly chop your pecans and stir them into the brownie mixture. Don't worry if the mixture is too thick. Simply add some almond milk (1tbsp at a time) to slacken it.